Computer crimes, such as distributed denial-of-service (DDoS) attacks, internet slander and defamation, and computer fraud are only increasing in volume and complexity. Also on the rise is the number of people being investigated and prosecuted for these offenses. For the past 10 years, cybercrime has been a significant focus for the federal prosecutors working in New York, with the Southern District of New York prosecuting a record number of cybercriminals year after year. If you are charged with perpetrating a DDoS attack, you need the expert advice of a New York City defense counsel for DDoS attacks and cyber crimes. 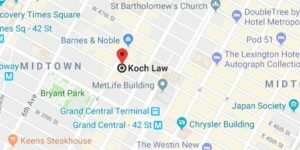 Lawyers with prior experience defending charges of DDoS attacks, like those at Koch Law, will understand the technical complexity of these cases and the underlying law. DDoS attacks span all levels of complexity and sophistication. It is also a cyber offense that can be waged against individuals, corporations, and governments and they are very hard to trace because multiple IP addresses are utilized for a single attack. Plus, DDoS attacks can thwart services by disrupting servers, devices, networks, transactions, or digital applications and even a temporary disruption on services can have a massive impact. These factors only add to the necessity of hiring New York City defense counsel familiar with DDoS attacks. New York still prosecutes all cyber crimes under a set of criminal laws called offenses involving computers. These 10 separate offenses vary in severity and are broad enough to cover an extensive range of illegal actions carried out through computers, other electronic devices, computer networks, and computer systems. An NY criminal lawyer is responsible for knowing and understanding each of these offenses. Computer tampering – computer tampering is when a computer, computer network, or computer service is unlawfully used or accessed for the purpose of altering or destroying computer data. An individual could be charged with computer tampering for distribution of malware or over flooding the bandwidth of a system. Computer trespass – computer trespass is the unlawful use of a computer, computer network, or computer service to commit a separate felony offense or knowingly gain access to computer material. Often, computer trespass is more applicable to DDoS attacks when the underlying objective is clear, such as terrorism, extortion, or theft. A New York City DDoS attack lawyer must also be prepared to defend charges in federal court. Several federal statutes criminalize the unlawful actions needed to perpetuate a DDoS attack. Due to the increased attention on these crimes by federal law enforcement and prosecutors, it is likely the criminal case will be handled in a New York City federal court. Defense of any and all New York City cyber crimes requires a top-notch, highly informed defense. Legal teams, such as Koch Law, that do have this requisite experience possess in-depth knowledge of current technology, types of computer crimes, and the implications of exact charges. This is information that can alter the outcome of your case for DDoS attacks.